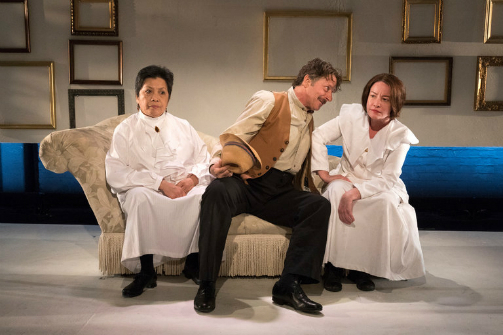 Mia Katigbak, Grant Neale, and Alyssa Simon in The Marriage of Alice B. Toklas by Gertrude Stein. Photo by Richard Termine. BOTTOM LINE: Four actors pretend to be more than thirty characters in this funny and profound play about the marital life of Gertrude and Alice. The Marriage of Alice B. Toklas by Gertrude Stein by Edward Einhorn is just what it purports to be—a play by Edward Einhorn pretending to be a play by Gertrude Stein about her life with Alice B. Toklas that's pretending to be a play about the wedding of the famous avant garde couple. If your head's already spinning over that sentence, you might want to think twice before checking the show out. But like they say, imitation is the sincerest form of flattery, and in this case, Einhorn has indeed composed a brilliant love letter for Stein and Toklas in the form of a whimsical, furiously funny, and ultimately profound play, with sprinkles of dada and farce. Even the title of the play teasingly recollects The Autobiography of Alice B. Toklas by Gertrude Stein, a bestseller of the renowned art connoisseur. Einhorn has a touch of magic in turning the romance of Alice B. Toklas (Alyssa Simon) and Gertrude Stein (Mia Katigbak) into a delightfully quirky 80 minutes of an intellectually charged feast. The carefully composed world of Gertrude and Alice is splayed across the wide stage of HERE’s subterranean space, with everything in perfect symmetry, and with vibrant colors like a Wes Anderson movie. Adorned in their almost identical white gowns, both Katigbak's deadpan Stein and Simon's wide-eyed Toklas take turns to narrate their life stories in this heightened universe where the two make believe a marital feast. It’s Gertrude and Alice being Gertrude and Alice, as well as the other way around: “I am Gertrude, pretending to be Alice so when I say Gertrude loves me I mean Gertrude loves Alice.” In other words, she (take your pick) is the wife, she is the husband, and they are the mirror image of each other, as well as the missing part of the other’s pursuit of a full life. 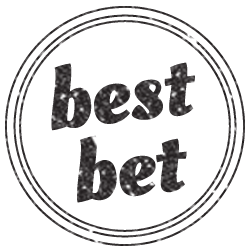 Their story is told in the style of a self-aware charm, endless pretense and suspended beliefs. The first half carries us through the process of a wedding in one dazzling and fluid stroke, from the night before to the day of the celebration. Gertrude announces each act and scene, and the pair play both themselves as well as other important figures. Completing the ensemble are Hemingway (Grant Neale) and Picasso (Jan Leslie Harding), both of whom similarly take on the “inceptional” task of embodying a menagerie of wondrous characters from Alfred Whitehead, Leo Stein, Picasso’s various mistresses, and so forth. Harding's portrayal of a slightly ditzy Picasso reminded me of Carol Kane's Lillian in The Unbreakable Kimmy Schmidt. Harding's Carl Van Vechten is equally delightful. Vechten is called Papa Woojums to Alice's Mama Woojums and Gertrude's Baby Woojums; the strange terms of endearment makes these legendary geniuses seem more relatable than ever, as the trio shares a heartwarming moment while Vechten officiates the Toklas-Stein marriage. After a champagne reception (and no, it's not an intermission, but indeed a component of the wedding celebration), the second half takes on a slightly more somber tone as reality is gradually revealed underneath the silly masquerade. Toklas becomes ever slightly so desperate, wanting to stage another wedding, while Stein begins to peel off the shells of make-believe. One of the most powerful moments, as the paintings on Alice's wall are taken off after Gertrude's death, left a lump in my throat. With all its whimsy and fluid rhythms, Marriage ultimately tells a moving story of love and loss. It will make you laugh, and then before you realize it, make you cry as well, because of the cruelty of the era in which it is set. Toklas and Stein's marriage was really a pipe dream, and like the playwright points out, "there's no happy end when two people love each other." The "hope" bug at the bottom of this Pandora's box, however, is revealed to be Toklas' hope to be reunited with Stein in their afterlives, since she was eventually converted, and Stein was a genius. And geniuses, Toklas says, get to have afterlives. The cast is superb. Katigbak and Simon have glorious chemistry as Stein and Toklas, while portraying their respective characters with tremendous accuracy. Harding is a chameleon in and out of her various "hats" (sometimes literally). And Neale's grumpy Hemingway (disappointed by Toklas, who excluded him from the rank of first-class geniuses) is at ease with his share of rapid character shifts. The technical aspects are also superb: the mix of projections and practical set adds magic to the piece, as well as the lighting design (Mary Ellen Stebbins) which elevates the piece into a vibrant dream. Marriage is an intellectually charged play accessorized with just the right amount of humor. The production is a perfect example of an harmonious co-existence of wild imagination, an excellent structure, and a strong central theme. If you thoroughly enjoyed Woody Allen's Midnight In Paris or the style of Tom Stoppard's Travesties, this will sure to be a blast. The play is also high-context, and if you don't know much about the heroines, a pre-show reading of Wikipedia pages about Gertrude Stein and her guests might be advised. The Marriage of Alice B. Toklas by Gertrude Stein is written and directed by Edward Einhorn. Set Design is by Justin & Christopher Swader. Costume Design is by Ramona Ponce. Lighting Design is by Mary Ellen Stebbins. Sound Design is by Mark Bruckner. Stage Manager is Berit Johnson. Assistant Director is Becca Silbert. Production Manager is Corinne Woods. The cast is Jan Leslie Harding, Mia Katigbak, Grant Neale, and Alyssa Simon.